Here I am, installing and updating the game I said I would not play. The sour taste of the previous games’ demise still lingers, and the sweet scent of being free of the series’ shackles is refreshing. I thought I could withstand the temptations of the newest Phantasy Star, but one thought of missing out on the sci-fi beauty of SEGA’s legendary RPG series was enough to awaken the HUmar in me. That young HUmar I speak of, going on 11 years old, was born during a simpler time. The internet was just flourishing, still tied to the tethers of phone lines and crap HTML design with the PC dominating the field. But SEGA had other ideas, a vision of the future to bring all couch-sitting gamers together through their TVs to online worlds and virtual basketball courts. Being able to experience this, the beginning of console online gaming, firsthand, was exceptional. 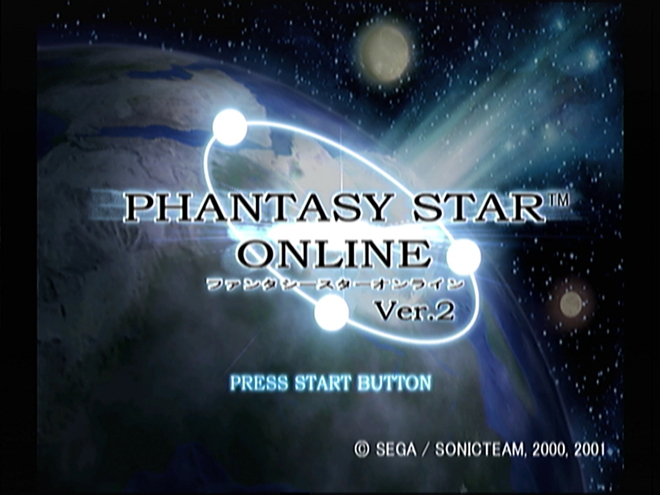 The game to usher in this new era would be Phantasy Star Online, the world’s first online console RPG, and to this day, I would argue still the best. 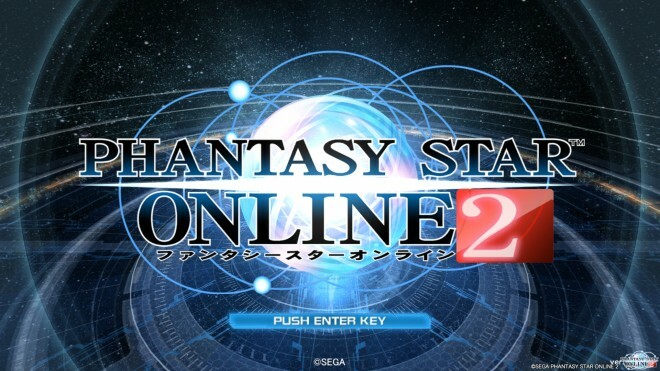 So come with me as I reflect on my first experience of playing PSO, and transversely my current experience of the newly released Japanese version of it’s numbered sequel, Phantasy Star Online 2. (note: PSO2 just came out 7/4/12 so it is still early in its life, and I’m playing on almost minimum settings so I cannot experience the game entirely how it was intended). When Brandon mentioned his first experience of PSO, and when I tried to remember my own, I wasn’t overcome with extraordinary emotion immediately, but when he kept reflecting, I began to share in his experience and the memories came flooding back. So, sitting on the toilet (the best place to think, just ask Suda51) a few days later, I finally realized what caused my amnesia! Subconsciously I stored a disturbing experience, one my brain labeled as fearful, into a vault for safe keeping and to not scare me at night (I wish drooling was my only problem). It may sound odd to pair the word fearful with a game so revered and acclaimed; one with yellow fluffy birds and characters with neon hair. However, what this game did to me 11 years ago was one of the most frightening and realistic experiences I have ever had playing games. I now (thanks Brandon!) remember it vividly. Sonic Adventure 2 demo aside (I may have been more excited to play that first, so I did) Eric and I started the game and were greeted by a rousing piano score and some peculiar, alien sounding squeals, as if they were calling out for help. The logo stood magnificently in the center of the screen, a blue glow spreading outward and pulsing subtly in a calming nature ready to welcome us into the experience as if an open hand were there to say, “Let’s Do This”. Of course, I let the game stay idle to see what Attract Screen would begin playing, in this case, it was the opening cinematic full of foreign imagery that I would one day remember almost perfectly. The enormous ship flying through space to the passengers’ new home, where comrades had already landed and started pioneering a new civilization. The glimpses of lush vegetation and uncharted land, then suddenly, the Central Dome beaming out to them and getting rocked by a Great Evil. All communication being lost with the group ahead of them, you are sent in to investigate and save any survivors, hoping that you will uncover the mystery. That’s all of the story I got, and it’s all that I needed to understand the world and its inhabitants. There was no unnecessary prose or lengthy dialogue, no boring cinemas or unplayable action cutscenes like those found in so many contemporary games. It immediately stood out to me and was more engaging then most typical RPGs that forced me to sit rather than play, slowing down the pace and forgetting why a game is fun. 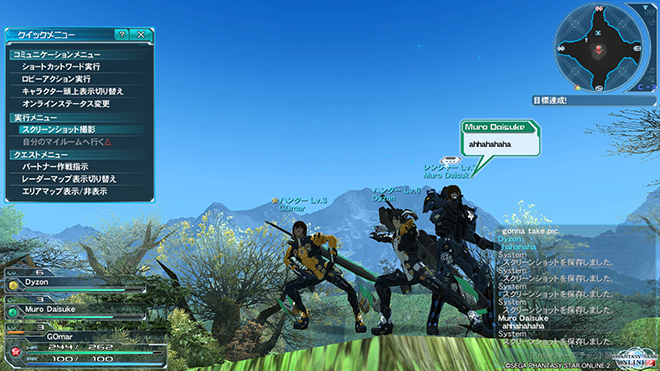 PSO2 is no different. After several days of trouble shooting and fudging my way through the Japanese I had the game loaded and watching the opening cinema. The craftsmanship found in the modeling and animation explodes with life and character, it’s quite apparent we are 11 years in the future from PSO. 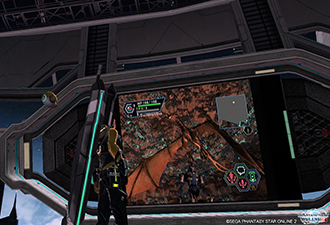 Instead of giving us narrative, SEGA introduces us to what makes PSO2 fresh and modern, focusing on fun and playing together with other Hunters: this is what you will be doing, and it is badass. Nostalgia and glee start rushing towards me, every second more cheerful. I’m actually sitting in front of the sequel to arguably the greatest game ever made, one that pioneered so many facets of an uncharted genre 11 years ago. Thinking about it makes me sad (how is my beard starting to grey?) but the depression subsides, counteracted by the spring, pop and echo of the menu sound effects which perfectly emulate the sounds of Big Bro PSO. The soothing melody playing in the background immediately gives me warmth, along with the excitement that this is something entirely new, entirely unseen and never experienced. 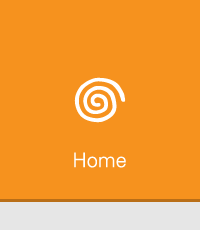 I sit a few minutes, taking in the euphoric sounds and marvel at the logo, elegantly designed and animated, welcoming me into this new, Brave New World. 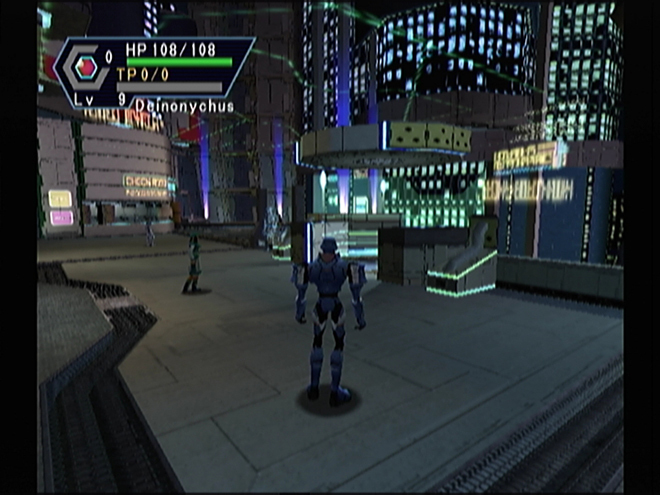 The main character in the first Brave New World of PSO was unique for its time, a creation entirely up to your choosing. I remember being excited that I had never been given the chance to create my own character in such a detailed manner, the breadth of options given seemed endless which enabled me to make one I had drawn for a comic, and have him look very close to his likeness. 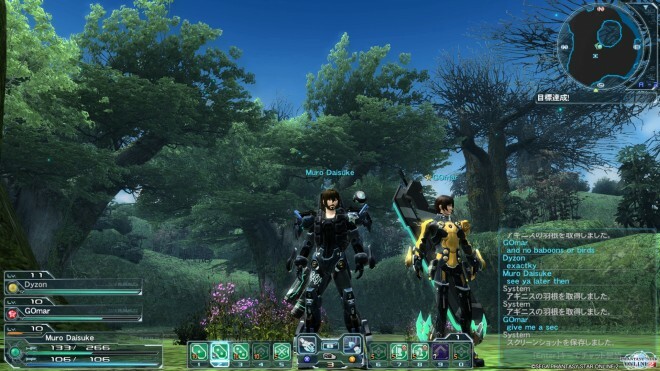 Fast forward to PSO2 and we’re given perhaps the most comprehensive customization in any game, the control given to forging your avatar is outstanding. I think to myself, how did I ever feel that PSO had so many options? The wealth and quality of the Races and Classes in PSO2 really shines, no matter which option I choose; Male or Female, Newman or Human, I would have a choice in making a character with personality and style. I spent at least three hours deciding on whom my character would be, what their name is and sculpted how they would look (no help to that darn’d randomizer option that wiped out my work a few times). I already have second guesses on what character I should have made even though I’m happy with GOmar the HUmar, but that just means I’ll have plenty of ideas for when the game comes out in English, Big Landman RAcast here I come! My character was ready, but my body may not have been for what lied ahead. Desolate, eerie, and magical, as I was transported onto PSO’s surface these feelings overtook me. Mystified by my surroundings I ventured forth, fearful of what I had begun. I could feel the crunch of the terrain beneath my weight, the gravity of the land evident in the frictional psychics and animation. The flow of the fauna filled the air with a rich presence, highlighted by peaceful azure lights, accenting the forest as they floated along with the breeze. Running along the edge was a stream of crystal clear water that fed the land, rows of rushing waterfalls filled the distance as the bright star light from above broke through the trees, glistening with essence. A delicate track played in the background, fitting serenely to the moment. The lonely atmosphere was immediate, and calming. Cryptic messages left behind by a fellow Hunter chronicling the trials they had endured instilled my fear, each more foreboding and warning of the danger that l would soon see. By keeping the story contained within gameplay, I was constantly immersed in the world, the illusion was never broken, I was living on the planet of Ragol. My first experience on this new planet of PSO2 is quite different, one less immersive and lacking the substance that made PSO so seamless. Status quo for the industry, I am given a tutorial walk-through of the basic controls and mechanics, instantly I am reminded I’m playing a video game, there is no illusion here. Oddly, NPC persons are chatting with me via the in-game cinematic chat system, much like the one found in Phantasy Star Universe. The action stops every time they forcibly begin a new tutorial, often halting my action abruptly. The pretzels, had I been eating any, were beginning to make me thirsty. Well, PSO2 didn’t start off on the right foot, but it can be forgiven, my REAL first experience of the planet’s surface is much more engaging. Firstly, there is definition to the land. Piles of rock nestle in a corner, shrouds of grass blanket the area and delay my character as he rushes through it. In the distance are snow capped mountains full of majesty and scale, piercing the crisp sky. A massive river divides the area, it splits off in different directions, each to a new path. I enter the water, thinking I can easily pass, but it pulls me back to where I came, everything in this world has meaning and life to it. Another beautifully crafted music track fills the air, blending perfectly to the environment, bringing a cheerful smile to my face. 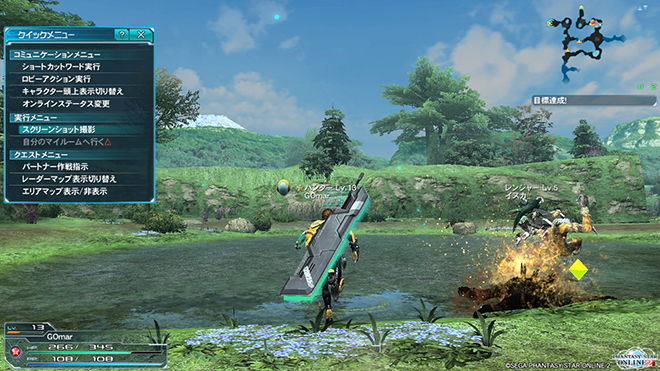 Seamlessly, the weather changes throughout the quest, a nice throwback to the changes in Areas from PSO. Rain pours down into a burgeoning pond, the droplets scattering the mirror image of the dream-like world around it. Brandon and I stand on a bluff, dancing like two fools when suddenly, a lightning bolt strikes leaving us shocked and laughing hysterically. This world is breathing, and changing, the randomness of it all keeps you attached and aware of everything. 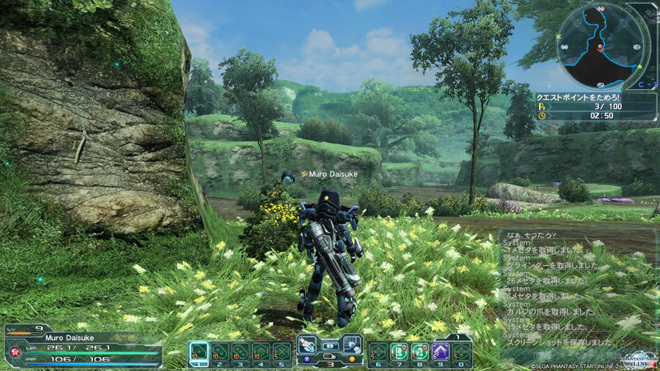 Perhaps the central character of the game are the environments themselves, just like in PSO, constantly changing and showing you new angles and points of interest. The music began to elevate, the tempo increased as it spiraled out of the tranquil sounds that greeted me. I was finally meeting the inhabitants of that planet Ragol, the sight of the menacing Booma from PSO, remains in me to this day. Such a fearful and unending stare, rows of teeth and a feral brow with devastating claws. I could feel them coming down on me, surrounding me with barely any room to budge. I was able to side step around one and begin my attack, the smashing of my saber had hit with a crashing slice. Retaliatory it swung back, dropping my health to dangerous levels as I fled several feet away. I quickly turned and continued my set of slicing at it, finally slaying the Native Beast as it roared into a puddle of its blood. Killing enemies never got old, it could be my millionth Booma massacre and it still felt as thrilling as my first. It was the start of an addiction. Nearly every encounter was fearful, more often than not, I was so overcome with enemies that I couldn’t even move, all I could do is hope I timed my attacks right and freed up an opening. Often I abused the connecting hallways as a place of refuge so I could heal and reset the enemy spawns, or if say, Baranz was in the room. I constantly felt outmatched and alone, terrified of why there were so many creatures there, and no survivors. Even after I managed to clear a room, it still felt like a nightmare. The blood of the fallen cascading across the ground, the deep red sharply contrasting the vibrant green of the leaves painted a fearful landscape. No matter how creepy the enemies or environments got though, I could always rely on the controls which were some of the tightest and perfect inputs in any RPG. 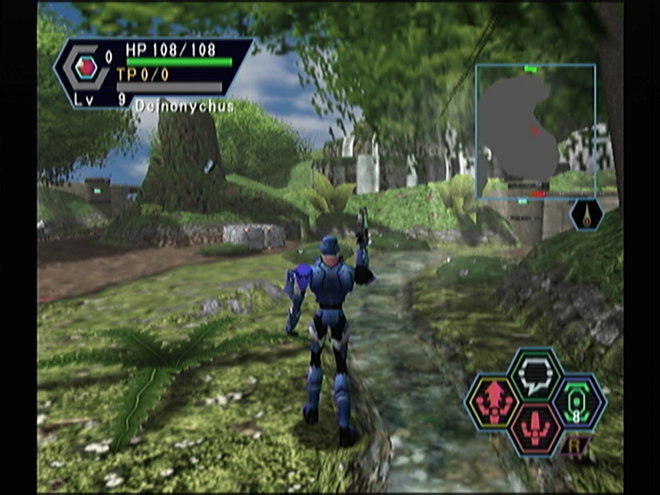 Even though PSO was presented as an action RPG, it was more akin to a modernized Japanese RPG. In replace of turn-based actions like in most standard RPGs, I was free to move and attack but each decision had to still be calculated and timed as if I was taking turns with the computer. Enemies would exchange blows with me, sometimes one for one, which really brought out that traditional RPG quality that was so endearing. The combat was like a dance with the enemy, a ballet of hit and run tactics and encircling of their blind spot to gain the upper hand. It was a delicate and exacting action, so crucial to what made the game so fun to play. This fresh movement and free form turn-based feel of the combat was so unique and wonderful, a throwback to games like Phantasy Star and Dragon Quest with the cutting edge of player control and gameplay at the time. That slow, calculated combat of PSO has evolved steadily over the years. As I grew, so too did Phantasy Star. Today, what greets me in PSO2 is the culmination of all those memories and refinements, along with some new features that are sensational to execute. Primarily, I can now jump. Which is stupidly fun and cheerful. Tackling the first batch of quests, often times repeatedly to find key items, feels different each time, and not because the layout or monster spawns change. Every time I set out, I learn something new or combo together actions that I didn’t know were even possible. The free range of movement shown in the opening movie, while not as elaborate, is such a blast to uncover and perform on the enemies. My personal favorite (nothing to do with KOing in Monster Hunter), is doing the slap shot Sword Photon Art to dizzy the creature, then continuing with the standard melee attack three times and finishing with thrusting my sword into them, lifting them up and tossing them back into the pack as the EXP points fly out of it. The combat is so smooth and flowing, the friction of hits combined with the acrobatic mid-air swordplay and swift-footed evasion gets me giddy and keeps me cheerful. Knowing I have only found a handful of the moves makes me even more excited, not to mention I have not touched the skills tree yet. The way I can customize my character, not only in looks, but how he moves and attacks is so addicting and satisfying. The enemies are no slouches either, aside from the introductory wolves and Rappy, they come to play hard ball. My first encounter with the giant stone covered, Hildebear-esque monster was cause for panic. I had to be Mooned three times, getting caught up in their sweeping attacks and large scale belly flops, these things are brutal with massive amounts of health. Even smaller enemies like the rolling lobster-tailed bugs are challenging, often going right through my advances, they’re so strong blocking doesn’t shield me from their terror. I’m really appreciating the challenge so far, and when I need to heal, I have to be careful, downing a Monomate takes a few seconds, leaving me vulnerable. The seamlessness of the online world stretches beyond the main lobby and city. Often, other parties will journey into the quest, visitors who lend a helping hand in times of need. Brandon and I are two-manning a special quest in a war torn City Level, one that resembles a superb PSU Ambition of the Illuminus level and makes “Open Your Heart” play in my head. After successfully repelling an onslaught of bugs with a nasty appetite for a defenseless woman, we become surrounded on a fleet of towering staircases. The swarm has the upper hand, but a stranger emerges, gunning into the nasty aliens and backing us up. I want to hope this rogue Hunter is saying nice things and complimenting our sense of style (or Brandon’s Beard), but, all they spoke is in Japanese. Brandon and I are barely holding on, the enemies are relentless, a warning message scrolls accompanied by a polite voice, presumably notifying us that time is up. We are pulled back into the space ship, and the quest failing to complete. If this is any indication of what’s to come, then it won’t be an easy journey ahead. The team work required to advance is the most promising feature for me, luckily I’ll have friends by my side (and hopefully my brother too). 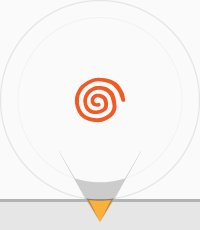 Unfortunately, my time spent playing PSO on the Dreamcast was a solitary affair mostly. Even with online in the title I wasn’t able to make use of its most revolutionary feature as much as I had liked, so the times I could play online weren’t taken for granted. As a world completely unknown to me, my first online game, the experience was exciting and awe-inspiring. This was a virtual reality, a place full of living people interacting with each other across continents and oceans. People in Japan could be living in the same place as me, able to communicate instantly via automatically translated text. This was unreal. However, being online, was a most fearful ordeal. Not only did I have to worry about the power going out (or someone ripping the power cord out of the wall) and getting hit by FSOD with a corrupted save file, but other players could seriously mess with my business. Another player masquerading as NOL joined my room, I was still on Pioneer 2 getting ready for a quest. They rushed towards me with a sly smile and the HUnewearl trot, I froze for an instant. Eric yelled out to run so I broke for the nearest corner and made it past the sliding door. The dubious character tailed me and played Ring Around the Rosy in the center of the quest counter room. As I ran, I cycled through the options and found the quit game button, my hands trembled but I was able to hit it in time, I had escaped. Thankfully, I was not NOL’d that day. I am now 11 years older and can buy my own things and do whatever I (mostly) want. Going online in PSO2 isn’t as dangerous as it was, and it still has that magical feeling and sense of wonder of playing with friends from distant places. Sharing the new world with longtime buddies, and remembering all of the good times we had with the previous games is really cheerful and brings a smile to my face whenever I log on. I’m having a blast with the absolutely goofy dancing animations, laughing uncontrollably at midnight with my window wide open, my cackles echoing into the neighborhood. It’ll be perfect once Eric logs on and the US version comes out, hopefully we can even get a little BOOST! The fearful memories of the first game, exploring that rich and mysterious world 11 years ago was the start of a pillar in my life forged with my brother and new friends growing into a cheerful experience. I would have regretted missing out on PSO2. I may have said I was finished with the series, and that I didn’t want to become addicted again but it’s Phantasy Star, and it has become a part of me. The time spent with friends and family over the course of years, accumulating to thousands of play hours in each installment has given me lasting memories that I will forever reflect on as some of my best times enjoying life. That may be a contradiction; it is only a game, the experience completely digital, but every Phantasy Star has given such a realistic and life-like sentience of its world and dangers that it transcends every feeling of playing a game.